In Fast-Changing China, Reality Can Overtake Fiction : Parallels Qiu Xiaolong has written eight detective novels based in his hometown of Shanghai. Qiu, who lives in St. Louis, embraces the advantages and problems of writing detective fiction in the Internet era, when Chinese people know so much more dirt about their system and leaders. 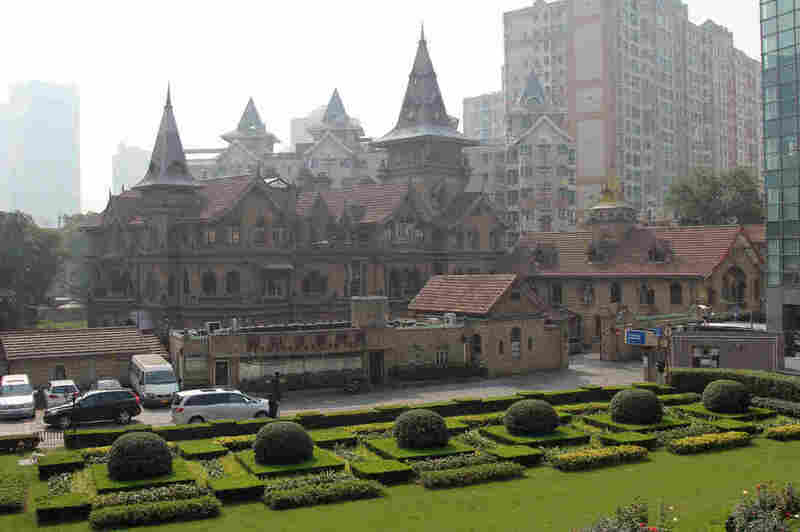 Chinese-American author Qiu Xiaolong sets his mysteries in Shanghai and uses famous landmarks for scenes in his novels, like this 1930s mansion that's been converted into a hotel. One of the challenges of writing about China is the country moves fast — sometimes faster than the publishing business. Take Enigma of China, the latest detective novel by Chinese-American author Qiu Xiaolong. In one scene, Qiu's main character, Inspector Chen, sits in a Shanghai restaurant scanning a hotel where government agents are holding a corrupt official in secret detention. Recently, Qiu took me on a tour of the book's real-life settings, including the site of that eatery. "It's a restaurant with a red lantern, so it's lovely," recalls Qiu, returning to the spot. "But now, I cannot find even any trace of it." That's because the government knocked it down and replaced it with a tiny park. "By the time the book comes out, the restaurant is definitely gone," says Qiu, standing on a street corner next to one of the city's elevated highways. "So, you see, it's hard to write about Shanghai nowadays." Qiu Xiaolong in his ancestral house during a visit from his home in St. Louis. Enigma is Qiu's eighth Inspector Chen novel. The books are set in his hometown of Shanghai, but few people here have ever read them. Because the plot of Enigma focuses so closely on corruption inside the Communist Party, Qiu says Chinese censors would never have accepted it. 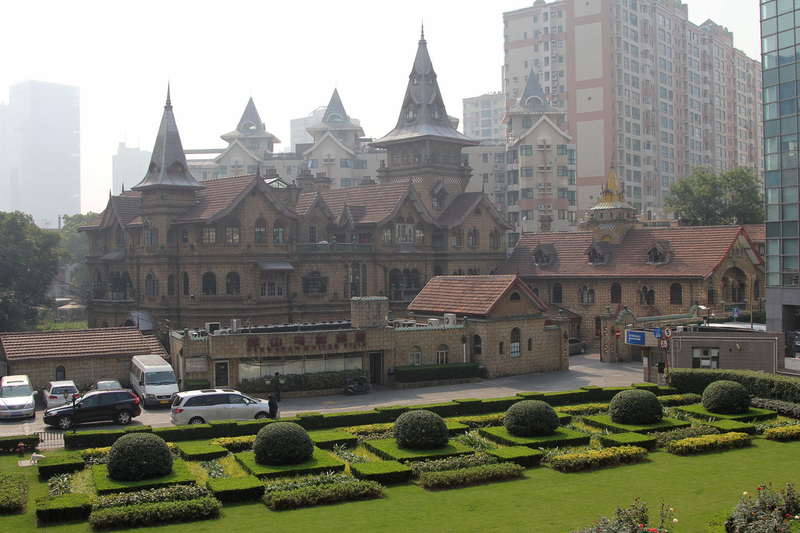 Qiu grew up here during the Cultural Revolution, which ran from 1966 to 1976. He moved to St. Louis in the late 1980s. Even though he's now 14 time zones behind Shanghai, he stays current by reading news and surprisingly free-wheeling discussions on China's Internet. That's where Qiu found the plot for the new book. "It's a real story," he says. The story begins with a public official, who gives a talk on the need to continue to support China's sky-high housing prices. It's a policy that benefits the government, but punishes and angers most ordinary Chinese, including netizens, China's citizen army of micro-bloggers. A photo of the official shows up in a newspaper with a very expensive pack of cigarettes on the table where he's sitting. Netizens conclude, as they do about so many Chinese officials, that this one is corrupt. They send the photo ricocheting around Weibo, China's equivalent of Twitter, and the official is sacked. "This entire scenario is taken from Weibo," says Qiu, an owlish, soft-spoken man of 60. "This shows people's effort on the Internet to fight corruption. Weibo can really tell you about what's changing in people's minds." In the novel, government investigators detain the official in a hotel, where he dies in what appears to be a suicide. It falls to Inspector Chen to solve the case, which his superiors want buried. Deaths in detention are not uncommon here. In April, investigators drowned a Communist Party member in an icy tub of water while trying to force him to confess to a corrupt land deal. 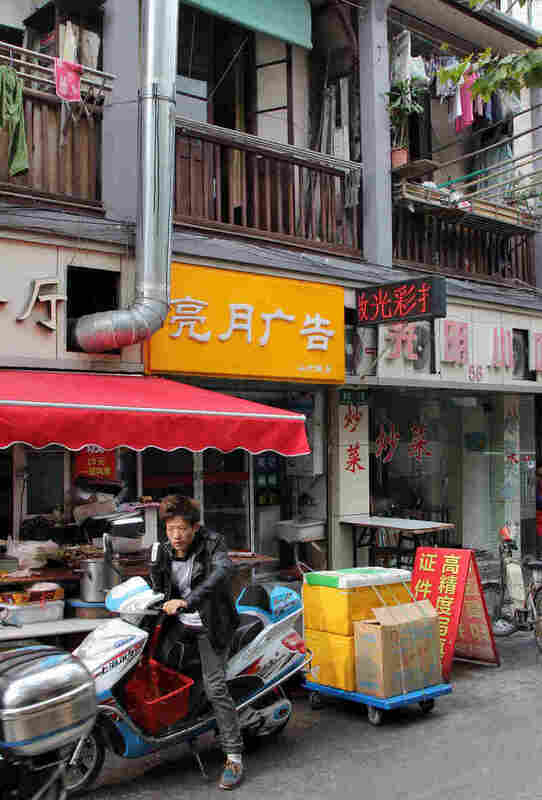 Qiu grew up in the house above the yellow sign here in the heart of Shanghai. Tina Kanagaratnam runs the Shanghai International Literary Festival, where she has featured Qiu's novels. She says his books show how Chinese people think and how the country's authoritarian system has shaped ordinary lives like Inspector Chen's. When Chen was young, he wanted to be a poet, but the government assigned him to the police department. 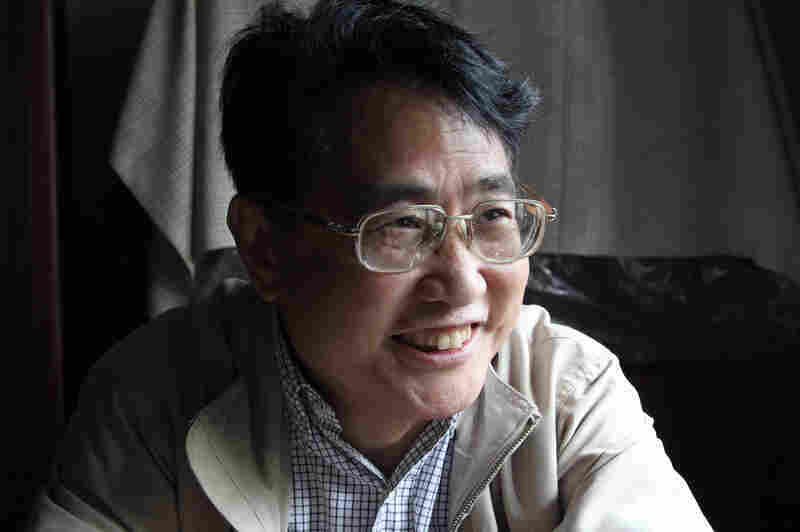 Chen still writes poetry, quite successfully, but like many Chinese who lived through Communism's darkest days, Chen wonders what might have been. "There are so many people in China who had dreams, who wanted to be something," says Kanagaratnam at a café in Shanghai's art-deco Peace Hotel. "But because they were assigned something else, they couldn't do that." Qiu grew up in a small house in the heart of Shanghai. It lies along an alley where neighbors chop vegetables and stir food in sizzling woks in open-air stalls. His colonial-era home is filled with old, carved furniture and feels like a museum piece. A rickety ladder leads to a crawl space with a skylight where Qiu used to write. "When I lived here, I used to work up in the attic," says Qiu. "These are my old, old books. This is the first time I've come back home for this trip." Actually, Qiu hasn't slept here in years, but he can't bear to part with the place. He stays at a hotel, because the house has few modern comforts. Although it's just a short drive from Shanghai's towering skyline, home to some of the world's tallest buildings, Qiu's house still has no plumbing. Qiu pulls back a curtain to reveal a big wooden box, a chamber pot. This is how people in tens of thousands of Shanghai homes still relieve themselves at night. Qiu loves the city with its old European villas, grassy parks and tree-lined streets, but juxtapositions like this make him pause. "You talk about mixed feelings about the city," says Qiu, his usual sunny demeanor growing serious. "People live just like this. They still use a chamber pot. No choice." The Shanghai of Qiu's novels is — like the city itself — a fast-changing landscape, one filled with contrast where a poet-detective tries to solve crimes, often against all odds, and remain true to himself.